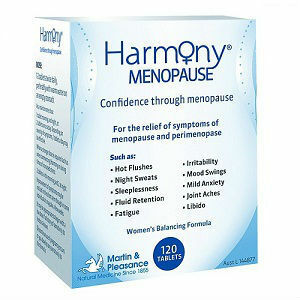 Harmony Menopause is a combination of 6 herbs and vitamin D3, calcium and magnesium traditionally used to relieve the symptoms of menopause and perimenopause. Women going through the hormonal changes of perimenopause and menopause need help to relieve stress and hot flashes and to provide nourishment for the whole body to help build energy reserves energy. Cholecalciferol: 2.5mcg (Vitamin D3 100IU). Directions: Tablets can be taken with water or juice, before meals or at least one hours after meals. The vendor source contains no price information. The product is sold through a dealer network and comes in 60 tablet containers. The product source contains a tool to locate a local vendor and also a contact phone number (the vendor is based in Australia) but provides no information on product guarantees or returns. The product source also contains no product testimonials. Anyone thinking of buying this product needs first to contact a vendor in their area to find out about product price and availability and also to find out more about product results, guarantees and product returns. Jackie Horowitz	reviewed Harmony Menopause	on October 14th	 and gave it a rating of 2.